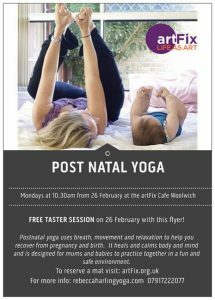 Postnatal yoga uses breath, a strong foundation, movement, balance and relaxation to allow the mum’s body to recover from pregnancy and birth. It helps to heal and calm the body and mind, and repair bodily tissues. 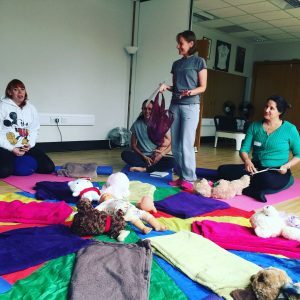 It is designed for mums with their babies and so incorporates the little ones into the practice, either using yoga asanas to keep the babies entertained in a fun and safe environment, or gently holding the babies as part of the yoga practice itself. Tickets cost £10 per session, with special offers available if you book 5 or more sessions! Rebecca’s love affair with yoga started 8 years ago on a retreat in Italy. She felt a sense of immense happiness and peace on the mat which encouraged her to deepen her practice and discover more. Rebecca has completed the Triyoga 2 year, 390 hour, teacher training programme under Jean Hall and Mimi Kuo-Deemer. She is a British Wheel of Yoga and Yoga Alliance Registered teacher. Rebecca’s own journey through pregnancy and motherhood inspired her to undertake further specialist study in prenatal, postnatal and mum and baby yoga as well as baby massage. Rebecca’s classes are for students of all abilities and they feature a playful, energetic but mindful flow with a particular focus on breath and alignment; intended to inspire a glow on the inside and out.